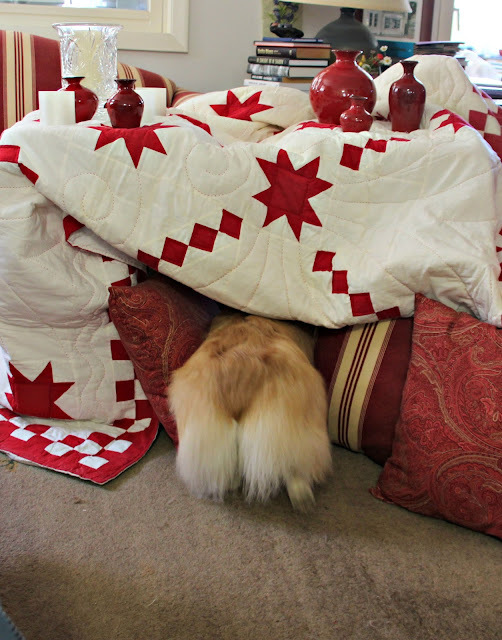 Meanderings and Muses: From Inside My Book Fort - - - Tom Robbins' "Tibetan Peach Pie"
From Inside My Book Fort - - - Tom Robbins' "Tibetan Peach Pie"
Today Annabelle and I are reading an excerpt from a book written by another of our literary heroes. And him - what a cutie! I got to meet him, ever so briefly, and I can tell you his personality is huge and lovely and fills a room. Here's a bit from his "Tibetan Peach Pie: A True Account of an Imaginative Life." From amazon.com: Internationally bestselling novelist and American icon Tom Robbins delivers the long awaited tale of his wild life and times, both at home and around the globe. “Robbins continues to embody Zen coolness and bohemian charm.” (Booklist (starred review)"